Our Girls TAASC group has had some fun and informative sessions since the start of the New Year. In a recent meeting the older girls learned about the signs and symptoms of hypothermia and how to treat it. Their favorite parts were learning about the “umbles” and then making a human burrito using camping gear and personal layers. The younger girls learned about a proper hygienic practice for Leave No Trace “pooping in the woods”. Ask them to tell you how! One chilly Thursday afternoon we combined groups and made a heat tent with a large tarp where we all huddled underneath on comfy pads. We talked about the meaning of an expedition with Becky telling her story of a 70 day, 850 mile river trip she did in the tundra of the Northwest Territories. The girls offered stories of their family expeditions, as well. Last week our combined group focused on working together to communicate and problem-solve multiple versions of The Maze. The girls had a blast working their way through this initiative, from one side to the other, finding different ways to communicate when their speech was “taken away”. Strong team work unfolded. Sophia Cross, Asheville High senior and long standing member of TAASC, has attended nearly all sessions, bringing her expertise, fine role modeling, and enthusiasm for girls and the program. All of the girls love her and so do the staff! She is an excellent example of how this program so positively informs and creates a confident, strong leader with amazing outdoor skills. We are so fortunate to have her with us! We are looking forward to the March 4th day-trip to Worley’s Cave with the younger girls, although any age girl and her parent(s) are welcome to join us. If you haven’t already signed up, please do so HERE. We will be sending out a packing list of what they should wear and bring to be prepared during and after the cave exploration. This guarantees to be a muddy and fun trip! Looking forward to more adventures with these awesome girls! This week our six and seven year old Taasc girls embraced the dark as we turned our attention toward our upcoming day trip to go caving! These girls have already been building trust with one another at meetings. It wasn’t that long ago that each girl was leading her blindfolded partner on a trust walk in the woods, and then they took it to the next level as they back up belayed each other at the climbing gym. During cave exploration each girl will not only be taking responsibility for herself, but will support the group through her leadership. In Girls Taasc we explore the many faces of leadership. Leadership looks different for each unique girl, and we honor each individual expression. On our climbing trip, the girls began to explore four expressions of leadership through the window of Angeles Arrien’s Four Fold Way. We began to learn about the way of the warrior – showing up and being present, the way of the healer – expressing care, appreciation, and gratitude, the way of the teacher – sharing what you know, and the way of the visionary – telling the truth about what you see without blame and judgment. The girls made some pretty cool pictures of how they are warriors, healers, teachers, and visionaries. As you might guess, there are lots of opportunities to work with themes of courage, support, and adventure as we move into our caving theme. And there are lots of opportunities for straight up fun, too. Last week the girls transformed into bats and pups (baby bats), with blindfolded mama bats locating their babies through sound and scent. Mini Girls Taasc is so awesome! Am I ever lucky to spend my Thursday afternoons with this group! Our weekly meetings are all about getting kids up and at it – ACTION! There really is no better way to learn than to do and at TAASC meetings we get real with some exciting activities. The goal is to introduce students to new skills and experiences in a gentle, non-intimidating way. This way students get that initial experience under their belt and by the time we get out on a weekend adventure trip, they’re ready. They know how to do most of the things they need to do to stay warm, dry and comfortable. Some students take longer than others to get comfortable with something like climbing or being up high. Meetings are a perfect environment for that student to baby-step their way towards confidence with that activity. 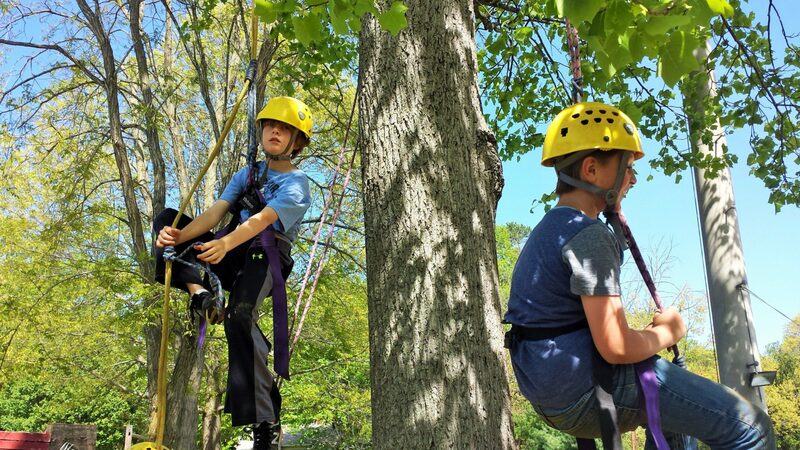 We teach kids how to prussik up a fixed line and once they get the hang of it – they get to decide how high and far they want to go. It’s a great activity to develop individual skills, confidence and empowerment. And at the same time they’re doing something totally cool and exhilarating going 40 ft up into a tree!